We have dealt thus fully with the recrudescence of scientific studies in the Middle Ages because of its ultimate importance in human affairs. In the long run, Roger Bacon is of more significance to mankind than any monarch of his time. But the contemporary world, for the most part, knew nothing of this smouldering activity in studies and lecture-rooms and alchemist’s laboratories that was presently to alter all the conditions of life. The church did indeed take notice of what was afoot, but only because of the disregard of her conclusive decisions. She had decided that the earth was the very centre of God’s creation, and that the Pope was the divinely appointed ruler of the earth. Men’s ideas on these essential points, she insisted, must not be disturbed by any contrary teaching. So soon, however, as she had compelled Galileo to say that the world did not move she was satisfied; she does not seem to have realized how ominous it was for her that, after all, the earth did move. Very great social as well as intellectual developments were in progress in Western Europe throughout this period of the later Middle Ages. But the human mind apprehends events far more vividly than changes; and men for the most part, then as now, kept on in their own traditions in spite of the shifting scene about them. In an outline such as this it is impossible to crowd in the clustering events of history that do not clearly show the main process of human development, however bright and picturesque they may be. We have to record the steady growth of towns and cities, the reviving power of trade and money, the gradual re-establishment of law and custom, the extension of security, the supersession of private warfare that went on in Western Europe in the period between the first crusade and the sixteenth century. Of much that looms large in our national histories we cannot tell anything. We have no space for the story of the repeated attempts of the English kings to conquer Scotland and set themselves up as kings of France, nor of how the Norman English established themselves insecurely in Ireland (twelfth century), and how Wales was linked to the English crown (1282). All through the Middle Ages, the struggle of England with Scotland and France was in progress; there were times when it seemed that Scotland was finally subjugated and when the English king held far more land in France than its titular sovereign. In the English histories this struggle with France is too often represented as a single-handed and almost successful attempt to conquer France. In reality it was a joint enterprise undertaken in concert first, with the Flemings and Bavarians and afterwards with the powerful French vassal state of Burgundy to conquer and divide the patrimony of Hugh Capet. Of the English rout by the Scotch at Bannockburn (1314), and of William Wallace, and Robert the Bruce, the Scottish national heroes, of the battles of Crecy (1346) and Poitiers (1356) and Agincourt (1415) in France, which shine like stars in the English imagination, little battles in which sturdy bowmen through some sunny hours made a great havoc among French knights in armour, of the Black Prince and Henry V of England, and of how a peasant girl, Joan of Arc, the Maid of Orleans, drove the English out of her country again (1429-1430), this history relates nothing. For every country has such cherished national events. They are the ornamental tapestry of history, and no part of the building. Rajputana or Poland, Russia, Spain, Persia, and China can all match or outdo the utmost romance of western Europe, with equally adventurous knights and equally valiant princesses and equally stout fights against the odds. Nor can we tell how Louis XI of France (1461- 1483), the son of Joan of Arc’s Charles VII, brought Burgundy to heel and laid the foundations of a centralized French monarchy. It signifies more that in the thirteenth and fourteenth centuries, gunpowder, that Mongol gift, came to Europe so that the kings (Louis XI included) and the law, relying upon the support of the growing towns, were able to batter down the castles of the half-independent robber knights and barons of the earlier Middle Ages and consolidate a more centralized power. The fighting nobles and knights of the barbaric period disappear slowly from history during these centuries; the Crusades consumed them, such dynastic wars as the English Wars of the Roses killed them off, the arrows from the English long-bow pierced them and stuck out a yard behind, infantry so armed swept them from the stricken field; they became reconciled to trade and changed their nature. They disappeared in everything but a titular sense from the west and south of Europe before they disappeared from Germany. The knight in Germany remained a professional fighting man into the sixteenth century. Between the eleventh and the fifteenth centuries in western Europe, and particularly in France and England, there sprang up like flowers a multitude of very distinctive and beautiful buildings, cathedrals, abbeys, and the like, the Gothic architecture. This lovely efflorescence marks the appearance of a body of craftsmen closely linked in its beginnings to the church. In Italy and Spain, too, the world was beginning to build freely and beautifully again. At first it was the wealth of the church that provided most of these buildings; then kings and merchants also began to build. 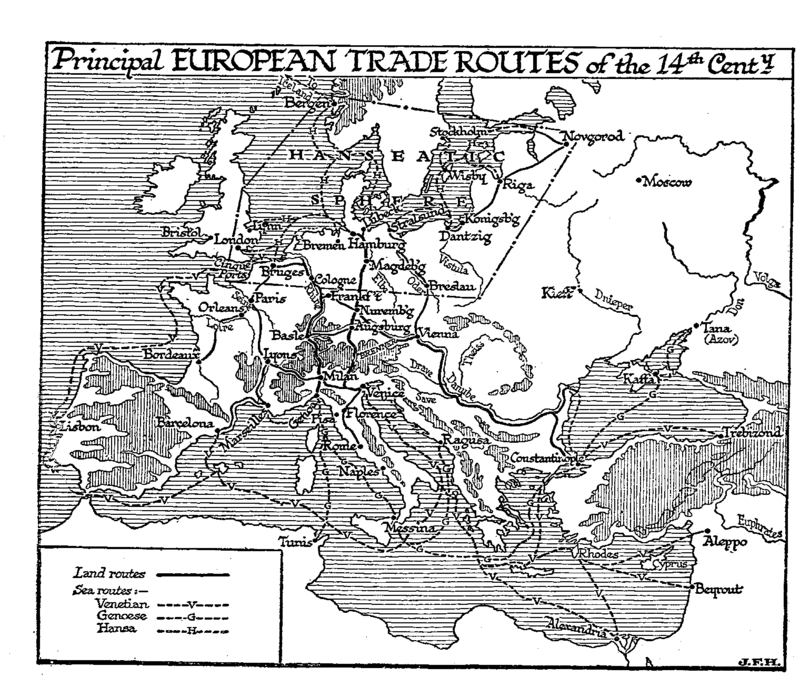 From the twelfth century onward, with the increase of trade, there was a great revival of town life throughout, Europe. Prominent among these towns were Venice, with its dependents Ragusa and Corfu, Genoa, Verona, Bologna, Pisa, Florence, Naples, Milan, Marseilles, Lisbon, Barcelona, Narbonne, Tours, Orleans, Bordeaux, Paris, Ghent, Bruges, Boulogne, London, Oxford, Cambridge, Southampton, Dover, Antwerp, Hamburg, Bremen, Cologne, Mayence, Nuremberg, Munich, Leipzig, Magdeburg, Breslau, Stettin, Dantzig, Koenigsberg, Riga, Pskof, Novgorod, Wisby, and Bergen. «A West German town, between 1400 and 1500, embodied all the achievements of progress at that time, although from a modern standpoint much seems wanting… . The streets were mostly narrow and irregularly built, the houses chiefly of wood, while almost every burgher kept his cattle in. the house, and the herd of swine which was driven every morning by the town herdsman to the pasture-ground formed an inevitable part of City life. In Frankfort-on-Main it was unlawful after 1481 to keep swine in the Altstadt, but in the Neustadt and in Sachsenhausen this custom remained as a matter of course. It was only in 1645, after a corresponding attempt in 1556 had failed, that the swine-pens in the inner town were pulled down at Leipzig. The rich burghers, who occasionally took part in the great trading companies, were conspicuously wealthy landowners, and had extensive courtyards with large barns inside the town walls. The most opulent of them owned those splendid patrician houses which we still admire even to-day. But even in the older towns most houses of the fifteenth century have disappeared; only here and there a building with open timberwork and overhanging storeys, as in Bacharach or Miltenburg, reminds us of the style of architecture then customary in the houses of burghers. The great bulk of the inferior population, who lived on mendicancy, or got a livelihood by the exercise of the inferior industries, inhabited squalid hovels outside the town; the town wall was often the only support for these wretched buildings. The internal fittings of the houses, even amongst the wealthy population, were very defective according to modern ideas; the Gothic style was as little suitable for the petty details of objects of luxury as it was splendidly adapted for the building of churches and town halls. The influence of the Renaissance added much to the comfort of the house. «The fourteenth and fifteenth century saw the building of numerous Gothic town churches and town halls throughout Europe which still in many cases serve their original purpose. The power and prosperity of the towns find their best expression in these and in the fortifications, with their strong towers and gateways. Every picture of a town of the sixteenth or later centuries shows conspicuously these latter erections for the protection and honour of the town. The town did many things which in our time are done by the State. Social problems were taken up by town administration or the corresponding municipal organization. The regulation of trade was the concern of the guilds in agreement with the council, the care of the poor belonged to the church, while the council looked after the protection of the town walls and the very necessary fire brigades. The council, mindful of its social duties, superintended the filling of the municipal granaries, in order to have supplies in years of scarcity. Such store-houses were erected in almost every town during the fifteenth century. Tariffs of prices for the sale of all wares, high enough to enable every artisan to make a good livelihood, and to give the purchaser a guarantee for the quality of the wares, were maintained. The town was also the chief capitalist; as a seller of annuities on lives and inheritances it was a banker and enjoyed unlimited credit. In return it obtained means for the construction of fortifications or for such occasions as the acquisition of sovereign rights from the hand of an impecunious prince». For the most part these European towns were independent or quasi-independent aristocratic republics. Most admitted a vague overlordship on the part of the church, or of the emperor or of a king. Others were parts of kingdoms, or even the capitals of dukes or kings. In such cases their internal freedom was maintained by a royal or imperial charter. In England the Royal City of Westminster on the Thames stood cheek by jowl with the walled city of London, into which the King came only with ceremony and permission. The entirely free Venetian republic ruled an empire of dependent islands and trading ports, rather after the fashion of the Athenian republic. Genoa also stood alone. The Germanic towns of the Baltic and North Sea from Riga to Middelburg in Holland, Dortmund, and Cologne were loosely allied in a confederation, the confederation of the Hansa towns, under the leadership of Hamburg, Bremen, and Lubeck, a confederation which was still more loosely attached to the empire. This confederation, which included over seventy towns in all, and which had depots in Novgorod, Bergen, London, and Bruges, did much to keep the northern seas clean of piracy, that curse of the Mediterranean and of the Eastern seas. The Eastern Empire throughout its last phase, from the Ottoman conquest of its European hinterland in the fourteenth and early fifteenth century until its fall in 1453, was practically only the trading town of Constantinople, a town state like Genoa or Venice, except that it was encumbered by a corrupt imperial court. The fullest and most splendid developments of this city life of the later Middle Ages occurred in Italy. After the end of the Hohenstaufen line in the thirteenth century, the hold of the Holy Roman Empire upon North and Central Italy weakened, although, as we shall tell, German Emperors were still crowned as kings and emperors in Italy up to the time of Charles V (circa 1530). There arose a number of quasi-independent city states to the north of Rome, the papal capital. South Italy and Sicily, however, remained under foreign dominion. Genoa and her rival, Venice, were the great trading seaports of this time; their noble palaces, their lordly paintings, still win our admiration. Milan, at the foot of the St. Gothard pass, revived to wealth and power. Inland was Florence, a trading and financial centre which, under the almost monarchical rule of the Medici family in the fifteenth century, enjoyed a second «Periclean ago». But already before the time of these cultivated Medici «bosses», Florence had produced much beautiful art. Giotto’s tower (Giotto, born 1266, died 1337) and the Duomo (by Brunellesco, born 1377, died 1446) already existed. Towards the end of the fourteenth century Florence became the centre of the rediscovery, restoration, and imitation of antique art (the «Renaissance» in its narrower sense). Artistic productions, unlike philosophical thought and scientific discovery, are the ornaments and expression rather than the creative substance of history, and here we cannot attempt to trace the development of the art of Filippo Lippi, Botticelli, Donatello (died 1466), Leonardo da Vinci (died 1519), Michelangelo (1475-1564), and Raphael (died 1520). Of the scientific speculation of Leonardo we have already had occasion to speak. From Dr. Tille in Helmolt’s History of the World . Charles Dickens in his American Notes mentions swine in Broadway, New York, in the middle nineteenth century.